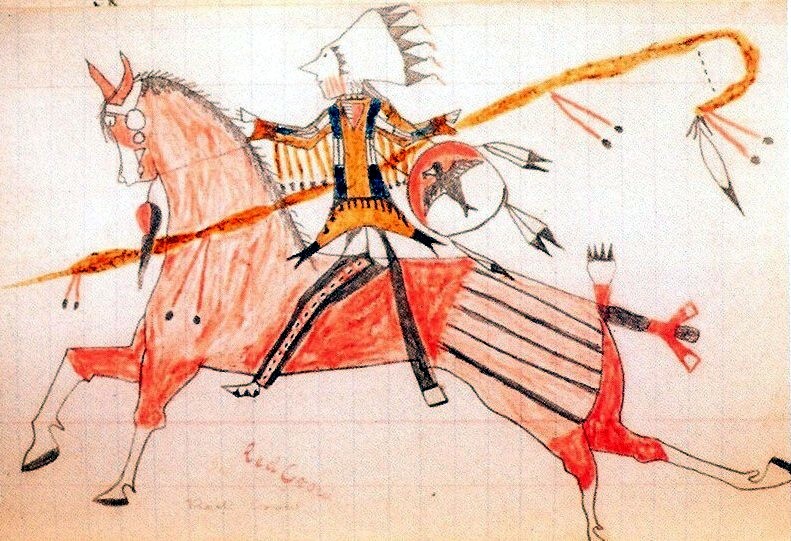 This entry was posted in Authenticity, Eagle, Feather, Fur, Horse, Horse Stick, Ledger Art, Materials, Native American, Native American Tribes, Oglala Lakota, Raven and tagged alan monroe, black hawk, lakota, lakota ledger art, ledger art, native american, plains indians, sioux, symbols by Native American Jewelry Tips. Bookmark the permalink. Paula, I really enjoyed this post and appreciate the gathering of this collection for our collective and personal enjoyment. I am desperately trying to find my collection of squash blossoms, rings and things and I may have identified the box they are in. I have a large and diverse inventory to share. Furthermore, your taste and scholarship have me blown away. I am so behind in my postings it’s not funny. I only have one squash out. But I’m not close to my treasure trove of items collected since age 12, including 6 squashes. The lesser squash is still here, separately. I need to post it along with other items. I will find them, along with others, but I must find them first. In Old Quebec, where I found and treasure my inuit drawings, and sculptures, I have a series deserving of appreciation and posting. My blogs and posting are as slow as a turtle. I posted my tortoise along with my heavy tortoise inlaid piece, and have found more. Anyway, I found my “Captains chest” and look forward to sharing its contents with you. I am an admitted “newbie” but always feel free to refer items such as the 2″ belt buckle because deep in my archives I have one. Plus I appreciate the “shout out” for the 2″ belt buckle. I have one and would like to share it. All my best regards, DaratheCollector. You are too kind ! I enjoy putting the posts together. I have hundreds of topics and questions to answer – if I could only do it full time ! I’m assembling quite a reference book collection and find that if I read about 6 that cover a topic, I get little bits of this and that from each one. Makes it a great adventure for me and I’m glad that readers find it interesting too. The blogs do take time – best of luck getting some of those treasures you have out there and talked about !